These were Mairead Maguire’s words, a Nobel Peace Prize winner from Northern Ireland, just one hour before she was shot with a rubber-coated steel bullet by Israeli Occupation Forces. At a press conference next to the Apartheid Wall in Bil’in, she stood beside Dr. Mustafa Barghouti, Palestinian Information Minister. Dr. Barghouti thanked her and the 500 attendees of the Second Bil’in International Conference on Non-violence. Regarding the Wall, he stated that it was an “instrument of ethnic cleansing, the same as what happened in 1948.” Barghouti suggested to read Illan Pappe’s book, The Ethnic Cleansing of Palestine for a clear explanation. Barghouti stated that the Apartheid Wall is being used to suffocate the idea of a 2-state solution and an independent Palestinian state. Describing the Wall, Barghouti said that it was 850 km in length, which is three times the length of the Green Line (the 1967 Armistice line), that the wall surrounds and imprisons cities and villages. Qalqilia was mentioned, a city of 46,000 Palestinians, which is completely surrounded by the Aparthied Wall. 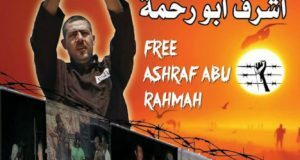 Barghouti closed by saying that there is no propaganda needed– just to show the pictures of the wall and checkpoints, for they speak for themselves. Just before the press conference ended, a huge Israeli high-powered water police-tank rolled through the opening in the Wall, demanding that all the vehicles of the press leave the premises. Further beyond the Wall, Tito, a Puerto Rican activist was waiting for his cue. After the press conference ended, he climbed the sky-scraping Israeli military tower housing the military camera, which watches over the village of Bil’in like the all-seeing-eye of the pyramid, recording every movement of the cages Palestinians in Bil’in. Cheering, “Tito! Tito!,” friends and activists snapped photos and a crew of supporters lingered below the massive tower. Military vehicles dispatched themselves to try and prevent the too-quick climber of Puerto Rico. As he reached the top, the cheers grew louder and waving high and proud over the beautiful village of Bil’in were the colors of red, white, green and black. It would be another five hours before Tito descended the tower. 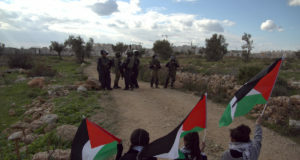 On the other side of the village, Friday prayers at the mosque were ending, and hundreds of Palestinians, Israelis, and international solidarity activists would march down the road towards the Apartheid Wall. But even with Dr. Mustafa Barghouti present and with the Irish Nobel Peace Prize Winner joining the non-violent demonstration, Israeli Occupation Forces utilized their usual violent tactics to try and quell the resistance. Blocking the path with armed soldiers about 100 meters before the Wall, soldiers began to fire tear gas into the crowd of 400 or so protesters. The crowd would disperse, covering their faces with bandannas and onion slices to dilute the suffocating gases. But the crowd would regroup and continue, Ghandi-style, their non-violent procession to the Apartheid structure. Israeli forces kept this up for quite some time, but as demonstrators reached closer to their goal, the occupiers added more ingredients to their recipe– this time using rubber-coated steel bullets. But the triggers of the occupier’s guns pulled anyways– the weapon of non-violence needed to be dismantled. Moments later, Masid Abu Tamer, a Palestinian Israeli a journalist for British Channel 2 was shot in the head with a rubber bullet. The Palestinian Red Crescent placed him on the stretcher and loaded him into the ambulance. “He’s the second one it 3 minutes that they’ve shot in the head!” yelled someone next to me. It is illegal under Israeli military law to shoot rubber bullets from a distance under 40 meters. They are considered lethal otherwise. Lymor Goldstein was shot by Israeli forces in the head last August from a distance of 10 meters with a rubber bullet. The bullet penetrated his skull and entered his brain. Luckily, he is still around and is serving as Tito’s lawyer right now as I am writing this. I saw Tomas from Denmark fall to the ground, Dawood from the UK hit on the inner thigh near his groin, Ali from Palestine hit in the leg, and tear gas canisters were oozing with white smoke from what seemed like every inch of the land. I exited the street to find a group of 8 Palestinian, Israeli, and internationals with their hands raised high to the sky, shouting not to shoot. Because of my medic background, and because of the recent shootings previously mentioned, I hovered nearby. Suddenly, Ms. Macguire, the Irish Nobel Peace prize winner was shot in the leg. Two other street medics carried her to safety and the army continued to fire into the non-violent crowd. The resilience was astounding. The demonstrators kept regrouping. Even Ms. Macguire, after being shot and with red, watery tear-gassed eyes– she rejoined the march. On the other side of army lines stood Dr. Barghouti, the crowd below Tito, and other activists who were being harassed by the soldiers. So we charged forward, through clouds of tear gas, and reached the hill toward the Wall. Soldiers refrained from firing tear gas now since we stood just inches away. The canon of the water tank moved its aim from the demonstration towards this new crowd of activists forming on the hill near the jeeps. Occupation forces started throwing people around, threatening them with arrest. Soldiers were swinging their batons. A young Palestinian boy was hit and was carried away over someone’s shoulder. The soldiers were trying to force the activists apart but they locked arms and became one solid unit that the army just could not dismantle. When the soldiers turned their attention on a singular activist and charged at him, the line of activists unlocked arms and puppy-piled on top of him, saving him from the soldiers’ abuse. Tear gas and rubber bullets continued to be fired at the demonstration back across the path. Those who saw that we made it across attempted to join us but the army was determined to not let this happen. And there was Tito was up on that tower. When a Palestinian teenager fainted from tear gas inhalation, demonstrators called for Dr. Barghouti. He came to the boy’s assistance, checked his jugular pulse, splashed some water on his face, and helped him off to safety. Others throughout the demonstration were treated with tear gas inhalation. Three internationals were detained, handcuffed, and brought to one of the army jeeps. Another was de-arrested by the group who made it to the hill. Soldiers were confining these activists to a small space. I could see them whispering to each other and it became clear to me that the water canon was pointing directly at the activists. (Water canons can knock the wind out of you and cause serious damage). And the soldiers kept backing away as if they didn’t want to get splashed. “Follow the soldiers!” one of the activists yelled. The soldier in the water tank would be less inclined to shoot at the activists if they were adjacent the soldiers. So no water was fired as the activists followed the soldiers’ steps, still locking arms. After some time, a Palestinian from the organizing committee amplified his voice over the bullhorn, saying that the demonstration should come to an end. He negotiated with the soldier that they would not fire at the activists during the retreat. As they left, they moved away the barbed wire that the soldiers had used as a roadblock. The demonstrators from the other side of the road marched towards the ones who had crossed the army line. Then, the three men who were arrested were released and rejoined the demonstrators. At this point, the Bil’in’s Second Annual Conference on Non-violence came to an end. The soldiers exited the gate in the Apartheid Wall. The demonstrators went to tend their wound, to expel the tear gas powder from their noses and lungs. Others, like Ursula from Switzerland, went to the hospital because she was shot in the stomach with a rubber bullet. Ana Maria, a 63 year old retired lawyer from Spain, tended to her stomach after also being hit with a rubber bullet. An estimated 25 people were either hit with rubber bullets, soldier batons, or received medical care from tear gas inhalation. And Tito remains in prison. It is the first time that the military commander has used a practice for an international that is normally used against the Palestinians. When a Palestinian is arrested, the army usually hold the person for 96 hours before even seeing a judge. The commander can then extend that 96 hours for and another 96 hours. With Israelis or internationals who are arrested in similar situations, they are usually released before 24 hours. Lymor Goldstein, Tito’s lawyer, has said that the court may deport Tito tomorrow, even though Tito was scheduled to leave Palestine on Sunday (tomorrow) anyways. 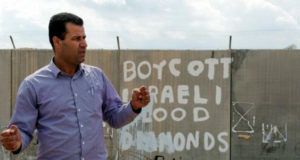 The people of Bil’in and their Israeli and international solidarity friends will be back next Friday, to continue their non-violent struggle against Israeli Apartheid and land theft.